This is my husband's favorite childhood snack and one that he used to whip up himself. This requires no cooking actually and just a quick blend in the mixie / blender and you have a tasty snack or a delicious prasadham ready. 1) First powder the aval in a mixie jar, then add rest of the ingredients and powder together. 2) Tasty aval is now ready to serve. Brussel sprouts was not a vegetable that everyone in the family embraced at first go. It has a slight bitterness to it and shares some qualities with cabbage as well. 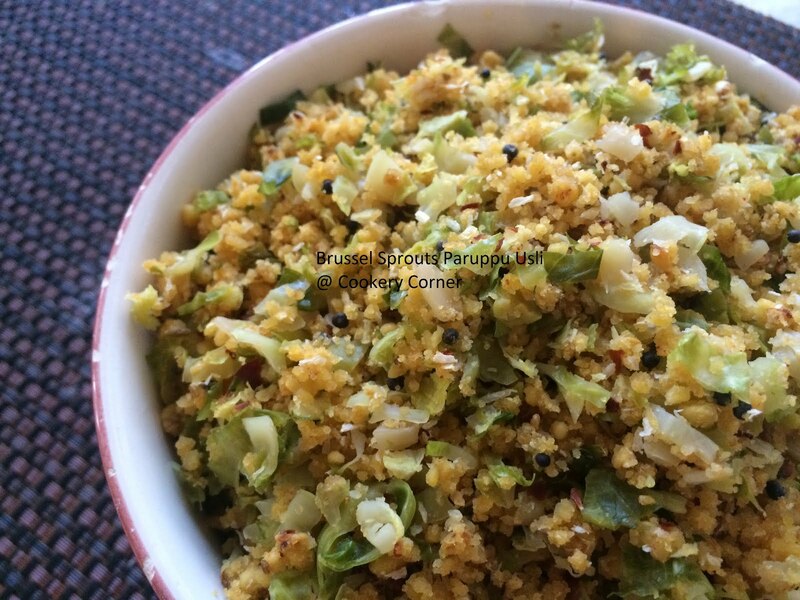 Thinking of ways to incorporate it, I remembered that my friend (when studying/working) used to rave about cabbage paruppu usli that her mom made and I thought I could try that with brussel sprouts since paruppu usli works well with other slightly bitter veggies like vazhaipoo (banana flower), kothavarangai etc. We were very happy with the result and this is something I have made several times now. 1) Wash, remove the hard end and chop the brussel sprouts finely. 2) Grind the soaked dhals, red chillies, garlic, jeera, salt, asafoetida and coconut to a coarse paste. 3) Smear 1 tsp of oil in a glass (or microwaveable bowl) and add the ground dhal paste and microwave for 2 mins, remove after a minute, stir the mixture and microwave again for another minute or two (let it stay for a minute). It should've cooked and hardened by this time but it won't be crumbly. 4)To rectify this, run the cooked dhal mixture in a mixie/blender until the mixture has a crumbled texture. 5) Heat a wide pan with oil and season with mustard seeds and curry leaves when hot. Add the chopped brussel sprouts and some salt to taste. Cover and allow to cook until crisp tender. Sprinkle some water as necessary. 6) Add the crumbled dhal mixture and stir together until combined. Cover for 2 minutes to allow the flavors to come together and switch off the stove. Paruppu usli is now ready to serve. I was amazed at the variety of food that was offered at Barbeque Nation restaurant. The fact that they have a full fledged buffet menu after all the initial appetizers came as quite a surprise and the kids and my parents enjoyed it too. My dad is a big fan of potato based dishes and he particularly liked the Cajun Potatoes that was served as one of the appetizers. Wanting to try it at home and make a healthier version of it, I gave it a shot and it turned out to be very good. I also made it as an appetizer for a party and our friends loved it too. The spicy, roasted potatoes combined the creamy dressing and the crunch of onions makes it a winner. Tip: Mix the potatoes with the dressing only when it's time to serve. I have had success with using Red potatoes and also keeping the skin is good for a nice crispy exterior. Olive Oil - 1 to 2 tbsp. 1) Boil the red potatoes in some hot water till they are par boiled. Inserting a fork in them should be easy but they should still be firm. 2) Meanwhile combine all the dressing ingredients and let it rest while the rest of the potato preparation go on. 3) Allow this to cool and cut into 1.5 inch chunks. Toss with olive oil, salt, turmeric and red chilli powder and spread evenly as one layer on a large baking sheet. 4) Cook in a pre-heated oven at 400 degrees F for about 20-30 mins till roasted and crispy. Flip once in between. 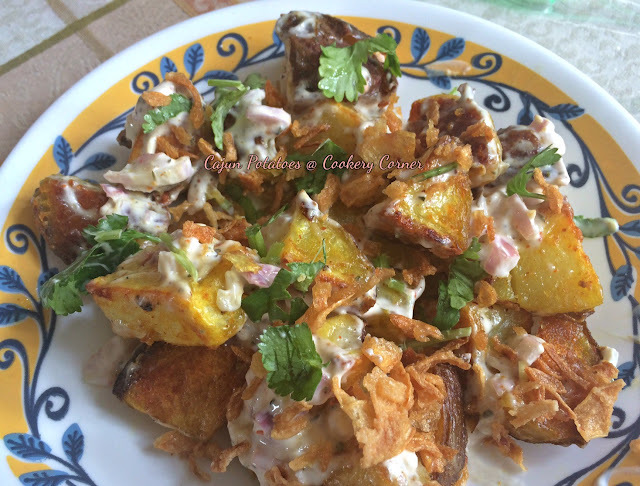 5) When ready to serve, combine the warm potatoes with the dressing and top with some fried onions, cilantro etc. This is a very tasty, easy and healthy recipe that is also perfect for the weather we are having - which has been rather cold and rainy... I have to thank my brother for this idea since he sent me pictures of the gluten-free noodles he used and inspired me to give this a shot by sending me his recipe as well. 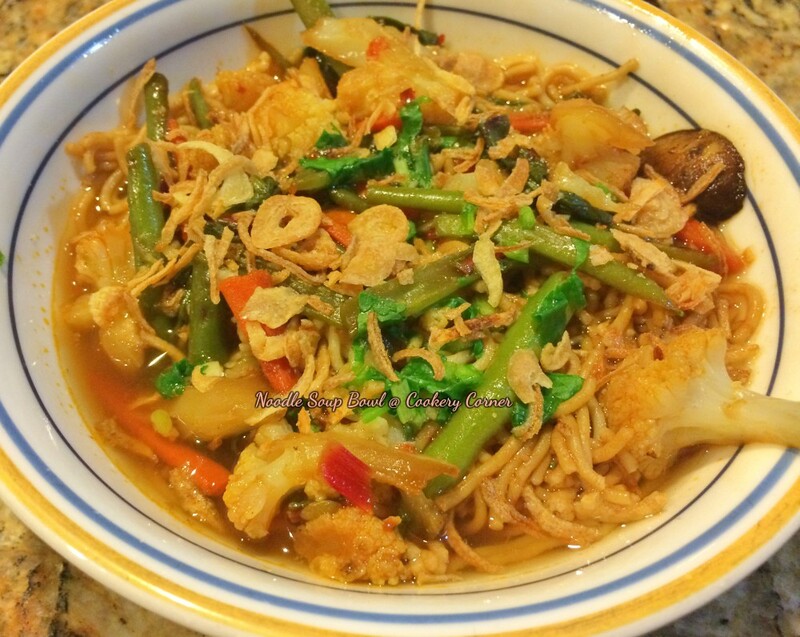 The 'Lotus Food' brand organic millet brown rice noodles are available at Costco but really any rice noodles or thin Somen noodles will work just fine in this recipe. As for the vegetable broth, I used the vegetarian better than bouillon paste mixed with water but one could also use store bought broth or use home made as well. Sesame Oil - 1 tbsp. Follow package directions to prepare noodles - about half cup per person should be good. For the soup - In a deep pot, combine broth, ginger, garlic, red chilli paste, soy sauce, spices if using and bring to a boil. Simmer on low-medium for about 10 -15 minutes. Add black pepper and salt to taste and sprinkle the chopped coriander. Cover and let the flavors mingle for about 5-10 minutes. For the vegetables: Heat a wok on medium high, add the sesame oil and toss in the vegetables. Saute for 5 to 6 mins, add the soy sauce, Sriracha and black pepper and continue to cook till crisp-tender. If you have mushrooms, you will want to slice and saute in a tsp of oil separately with some salt and pepper. To Assemble: In a bowl, add a serving of cooked noodles, top with the stir fried vegetables, and pour in the soup till the noodles and veggies are covered. Sprinkle with fried onions and chopped spring onions or coriander leaves. Dig in! I had a few apples that were a bit sorry looking and it didn't seem like we could enjoy it as is, so I was thinking about a jam and the timing of having an abundance of beetroots as well made me think of a combination of apples and beets to make a jam. The resulting jam had a beautiful color (of course) and it tasted really good. 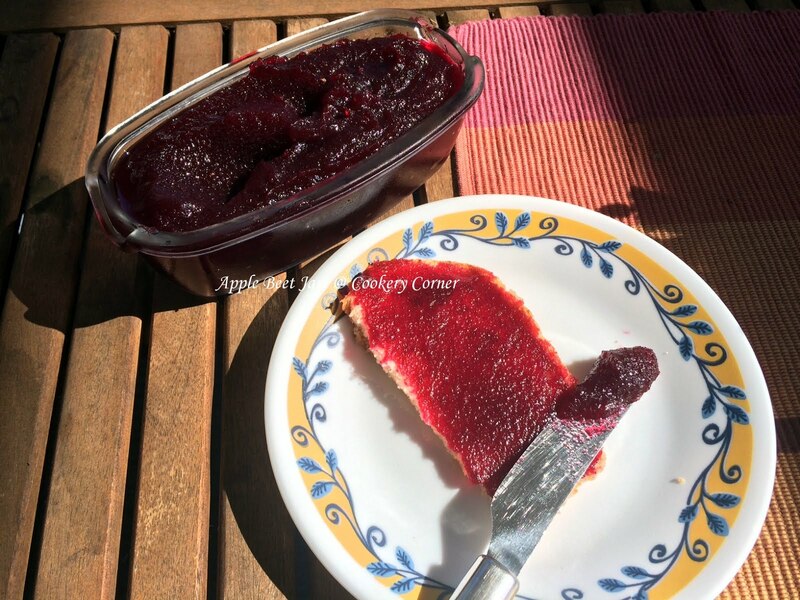 The kids loved it on slices of toast and when I quizzed them on the ingredients, they got the apple right but did not guess the beetroot and were quite surprised. I didn't add too much beets since I didn't want its flavour to overpower the jam... but it was a fairly large beetroot that I used in comparison to the size of the apples. 3) Grind together (I used a Blendtec) the beet pieces, apples and ginger with a little water if needed to a fairly smooth paste.For the above measurements, I got close to 3 cups of the ground mixture. 4) Heat a heavy bottomed, deep pot and add the ground paste with sugar. I used 1.5 cups since the apples and beet had some inherent sweetness.... you can go upto 2 cups for a sweeter jam. 5) On medium heat, continue to cook this (it will splatter, so take care) with occasional stirring for the first 20 mins or so and more frequent stirring as time goes by. I found that partly covering the pot, helped reduce the splatter a bit and enabled the jam to cook faster. 6) Add lemon juice after 20 mins and cook until the jam thickens. Test: You can test by freezing a plate - pour jam on very cold plate, and draw a line with your finger to split the jam, if it is done, it should not come back together (and stay on separate sides). 7) Remove from stove and allow to cook completely (it will thicken more upon cooling). Store in a sterilized glass bottle and refrigerate. This is a great alternative to flour pancakes and has a lot of flavor from the apples, cinnamon and vanilla.... While my son likes oats, my daughter is not a fan and if I'm careful to say Apple Pancakes (instead of Apple Oatmeal pancakes) she ends up enjoying these pancakes and I am happy knowing that she is eating something healthier than pancakes made with all purpose flour / maida. What I like about this recipe (besides it being rather nutritious) is that putting all the ingredients in a blender means the batter is whipped up in no time. 1) In a blender, add the oats, cinnamon powder, salt, baking powder and blend for 30 seconds until the oats are fully powdered. 2) Next add the eggs, coconut oil, milk, vanilla, sugar or maple syrup and allow this to blend for another 45 seconds until you have a smooth batter. 3) Meanwhile heat a pan/griddle on medium low heat (about a 4 on a scale of 1 to 10) and when the pan is hot enough, brush some coconut oil or butter and pour batter to form small pancakes. 4) Sprinkle Chocolate chips if desired and cover the pancake. Once bubbles start to appear on the top, flip and cook the other side as well. Serve plain (since it's sweet enough) or if you skipped the sugar - you can drizzle some maple syrup or chocolate syrup. NOTE: If using Flax seeds as a substitute for egg. Ensure you add it to the oats in step 1 and grind it. Also you will have to increase the volume of milk or water by another half cup to 3/4 cup. Due to the texture of the flax seeds the batter tends to thicken as it stands. 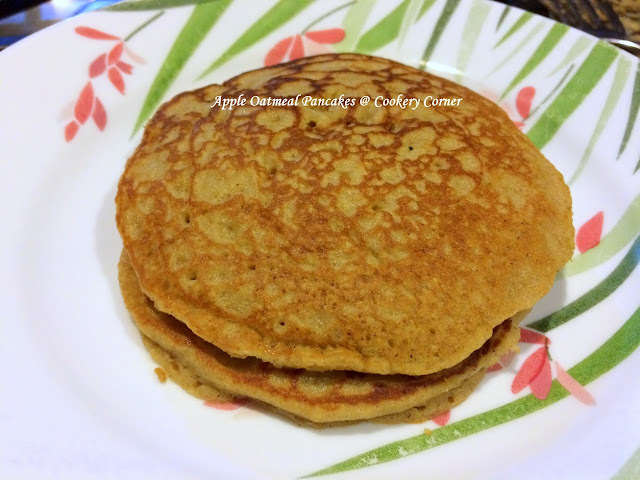 I have tried both versions and our family prefers the version with egg since it results in fluffier pancakes but flax seeds also work fairly well as long as the consistency is taken care of with additional liquid. Though we love my usual egg curry recipe, I was craving something new to try (and without coconut in it since I had made thai curry the previous day) and came across this recipe and the fiery color of the curry caught my eye. I followed this recipe with a few modifications and it resulted in a finger-licking gravy that was spicy and had a hint of sweetness going through it that helped deepen the flavor. The important aspect is to cook on a low to medium flame for a longer time so the masala comes together really well and is smooth.It goes great with rice especially and also rotis. 1) Hard boil eggs: Place eggs in a bowl of water (covered) and bring to a boil. Once water boils, switch off stove, cover and allow to rest for 20 minutes. Drain hot water and add cold water, leave for a few minutes before peeling. 3) Heat 2 tbsp oil and add the mustard, bay leaf and cumin seeds, follow with green chillies, onion, ginger, garlic and fry for a few minutes before adding salt, sugar and allow this to cook on a medium flame for about 8 to 10 minutes or so, until onions soften and start to caramelize a bit. 4) Next add turmeric powder, tomato puree, chilli powder and garam masala/egg curry masala and stir and allow this to continue to cook on a medium or medium low flame until the masala is well cooked - you may have to stir frequently to avoid it from burning. Add about a cup or so of water and allow this to simmer for 20 minutes or so. 5) Adjust water to desired thickness and slip in the eggs at this point and allow to cook for another 5 to 10 minutes before curry is ready. This, I understand is a popular Mangalore / Udipi dish and the addition of spices and tamarind sounded very interesting so I decided to give it a try. 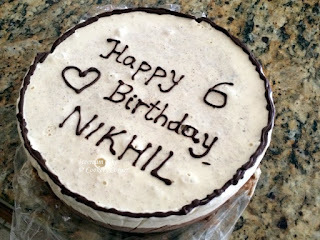 I used this recipe from RedChillies as a base and we really liked the end result... It's a flavorful dosai and we really liked the coconut flavor that came through as well and I added some cabbage as well to add some veggies and a slight crunch and the best part is no fermentation so just a few hours of soaking and it can be made about 30 minutes later. 1) Wash and soak rice for 4 hours at least. 2) In a small pan, heat half tsp of oil on low flame and fry the cumin seeds, coriander seeds and dried red chillies. 3) Drain the soaked rice and add to a blender, add the fried spices, jaggery (if using), salt and grated coconut. Add sufficient water to grind to a smooth batter. 4) The consistency usually is that of a dosa batter, however once i stirred in the finely chopped cabbage I discovered that it was not easy to spread the batter. Once it was mixed with a bit more water, it was easy to pour the batter onto a hot pan (without spreading like we do normally for dosas) and it turned out crispier this way too. 5) I used coconut oil to drizzle on the dosas. Also i covered the dosa when cooking the first side and flipped it over and cooked the other side too. That's it, dosas are ready and it was awesome with chutney and sambhar. This is not a detailed recipe but more of a twist/idea on an existing recipe. Since the kids were getting bored with the usual dosais and idlis, I decided to pour dosa batter (follow the same recipe as idli batter and mix with a few tbsps of rice flour and water) on the waffle iron and the result was a crispy, crunchy exterior with soft dosa in the middle. Kids really loved this twist. I used about 1/3 cup for my waffle iron and this is a normal waffle iron (not the one that makes belgian waffles). Even as I signed up for the Bake Sale at my daughter's school, I started imagining the possibilities and initially started with lofty goals of making cutely decorated cake pops or pretty cupcakes but then as the date drew closer and I realized I would be doing much of the baking on a weekday and so needed baked goods that were quick and easy to make, would keep well and not require refrigeration.... So, I started to fall back on my usual recipes like Chocolate chip cookies and Brownies but my daughter got swept into the excitement of it all and insisted that we offer something different and with a twist and not the usual fare. She searched high and low for recipes or ideas and since her favorite flavors are lemon, mint and raspberry she was thrilled to find Emeril's recipe for these Lemon Raspberry Thumbprint Cookies. I was skeptical about trying something new for a bake sale (in case it flopped, I may not have time for a redo ) but she convinced me fairly well on how this was an easy recipe, had great reviews and that it would taste good. So we chose this cookie recipe and a twist to our usual brownie recipe to incorporate some whipped cream cheese with vanilla and sugar for a Cheesecake Swirl Brownie. True to her words, this is a very easy recipe that gives fabulous results.... The cookie is buttery with a fragrant, bright lemon flavor and the tartness of the raspberry jam makes for a cookie that is not cloyingly sweet but tastes fabulous. 1) Combine Flour, Baking Powder, Salt and Lemon zest in a medium bowl and mix together. 3) Next beat in the egg yolks , lemon juice, vanilla extract. 4) Add the Flour mixture in 2 batches and beat until moist clumps form. Mix the dough with your hands and refrigerate for about 30 minutes atleast (you can also let it stay in the fridge covered for a day). 8) Once the cookies are pressed down, fill the indentations with half tsp of Raspberry Jam. 9) Bake for 13-16 minutes until the bottoms turn golden. Remove and allow to cool completely. Store in an airtight container. This is a very versatile recipe and you can change the fillings to make different variations and flavors.. such as strawberry. Or you can skip the lemon flavoring and fill the cookie with some nutella or with some chocolate and nuts. We packed our goodies in ziploc bags and stapled some decorative napkins (cut into strips) to make them "fancy" and more appealing. Both, the cookies and the brownies were sold out and that made us very happy. This is my saviour on most days when it comes to preparing school lunches for the kids, especially if I have leftover rice from dinner. No time to chop veggies? eggs can make this come together in a jiffy. Or you can even mix both veggie and eggs when making fried rice. Or substitute with chopped mushrooms for a mushroom fried rice. Jasmine Rice has the perfect texture for fried rice but pretty much any other rice that we normally use (ponni raw rice, sona masuri, or basmati) will still work. It is better to have rice to that has been cooked and refrigerated so the grains stay separate... Wet fingers and crumble the rice so they don't stick to your fingers. 1. Heat a wide pan on medium or med. high. Once hot add the oil and coat. 2. Add egg (or the veggies). Scramble (or saute) with some salt and black pepper. 3. Once egg is scrambled or veggies are crunchy, add the rice and the soy sauce, chilli sauce and ketchup and stir on a med-high flame. Hot, tasty fried rice is ready to serve. We had these Green Bean "Fries" at a new movie theater that has opened near our home... The new concept these days is to combine snacks/dinner with movies.. where you can order while watching a movie or buy and take inside to much on while enjoying the movie and the varieties are much more than popcorn/candy. While I would much prefer samosas and hot tea as munchies, we did enjoy these spicy green bean fries and brownie bites. Back home, I wanted to re-create the dish but had no intentions of deep frying green beans and decided to try a baked version and it was delicious - especially when it's just out of the oven. The beans were cooked perfectly and they had a spicy, crunchy exterior. 1) Prehead oven to 425 degrees F. Line a baking tray with aluminum foil and spray with oil evenly. 2) Keep three separate wide bowls or plates ready: in the first one add 3 tbsp flour, in the second one combine egg whites with 1 tbsp flour, garlic powder, dried italian seasoning, salt, pepper, sriracha. For the third one combine in a mixie/blender , bread crumbs, parmesan cheese, red chilli flakes and spread out (preferably in batches so it doesn't all get wet and clumpy). 4) Take a few beans at a time and dredge in flour, the wetness of the beans will help the flour adhere to the beans. Next dip in the egg-white mixture and roll in the breadcrumbs and off to the baking tray... Repeat this process until all beans are done. 5) Spray some oil on top of the beans and bake for 10 mins one one side, flip the beans and allow to cook for another 7 minutes. Enjoy hot. 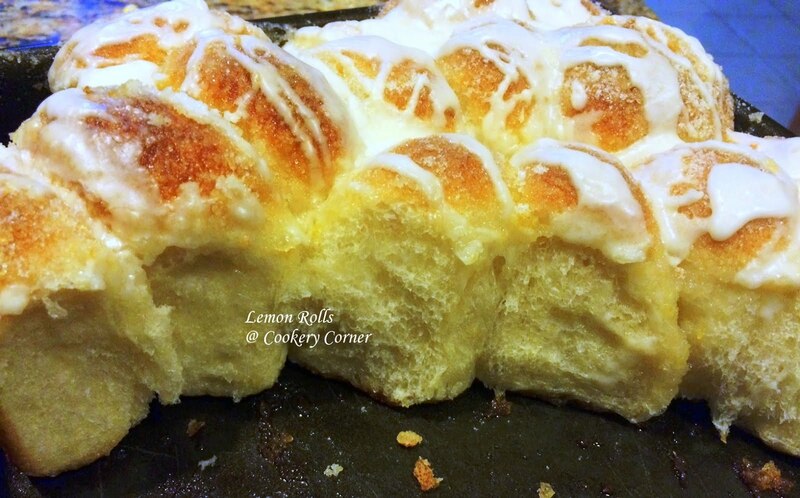 You could use your favorite dinner roll recipe and make it from scratch but I took the easy way out and used the frozen dinner rolls (Rhodes brand) that I purchased from the supermarket. I also tweaked the original recipe a bit to reduce the butter & sugar used. 1) Mix lemon zest with sugar in a small bowl. Spray a 9x13 baking pan with oil. 2) Cut each roll in half and place on the baking pan, close to each other but with some space (once they rise they will touch each other) Brush the rolls with the melted butter. 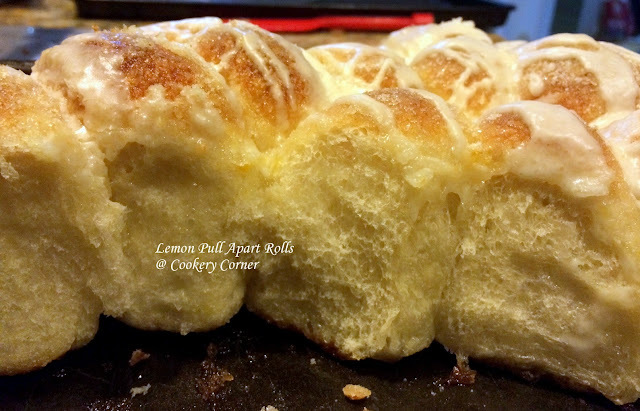 3) Sprinkle half of the sugar-lemon zest mixture over the buttered rolls. Cover with plastic wrap and let it rise in a warm place until doubled in size. 4) Remove the plastic wrap and sprinkle the remaining half of the sugar mixture evenly over the rolls. 5) Bake in a pre-heated oven at 350 °F for 20 to 25 mins (or till baked through and golden) Remove immediately from pan and place on a cooling rack. 6) In a small bowl combine the ingredients for the glaze and mix well till smooth... drizzle over the rolls once they cool a bit. One was a chocolate cake with a raspberry whipped cream frosting. The other (zero) was a vanilla cake (recipe below - used the one for magnolia cupcakes) with a lemon whipped cream filling ( i added some zest and it made for a vibrant, tasty filling). 2) Grease and flour a 9 inch cake pan. Combine both flours in a small bowl. Combine milk and vanilla. 3) In a large bowl, cream butter till smooth. Then add sugar gradually and beat until fluffy (about 2-3 minutes). 4) Add eggs one at a time, beating well after each addition. 5) Divide flour mixture into 3 parts - this is the dry mixture. Add one part of dry mixture and alternate with half of milk and vanilla mixture. Alternate ending with dry mixture. Beat each time until ingredients are incorporated without over beating. 6) Transfer batter to a pan and bake for 30 to 40 minutes or until a toothpick inserted comes out clean. As for my son's birthday in August, I couldn't be around and missed his birthday since I had to travel for work. We just got back from a trip to India as well and that meant I didn't have time to unpack before I had to pack up and leave for the work trip so I couldn't make a cake in advance either. However he had his grandparents, dad and sister to celebrate with him as he turned 6 and I had to be content with videos and pictures. After I got back, I asked him what cake he would like and though he was talking of an "Iron man cake" initially he was excited at the prospect of an Icecream cake so we did that instead and it turned out to be a different experience... I basically layered vanilla and chocolate icecream with some chopped oreos thrown into the mix... so it was super duper easy. A salad, as pictured, also works well as a side. It's also easy enough to be a weeknight dinner. 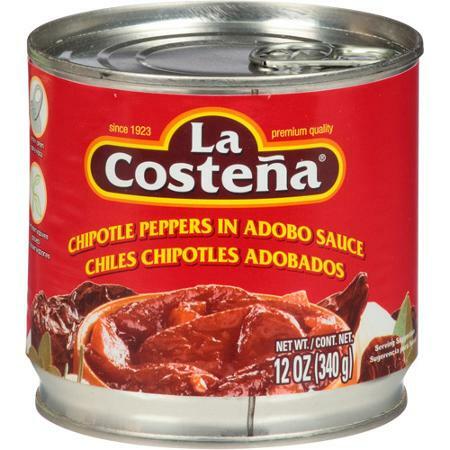 1) In a pan melt 2 tsp of butter and saute onions, garlic and the chopped chipotle chillies, saute for a few minutes. then add tomatoes and a bit of salt. Allow this mixture to cool a bit. 2) Grind together the onion-tomato-chili mixture with some sour cream or greek yogurt to a smooth sauce. 3) In a pan, melt 1 tsp of butter and add mushrooms (or boiled potato cubes) in a single layer. Allow to cook down - no need to stir. 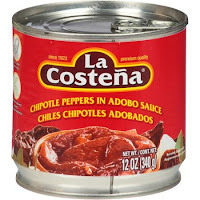 sprinkle some salt and saute for a few more minutes before adding the chipotle sauce with some water to thin it down. 4) Allow this to come to a boil and simmer together for about 10 minutes or so until it thickens. Add in the cubed paneer and allow to cook for 5 more minutes. 1) Heat oil in a pan, and add cumin seeds, toss in chopped garlic, jalapeno (if using) and onions and saute for a few minutes. 2) Next add chopped carrots, corn, tomatoes and continue to saute with some salt & turmeric powder. Add chilli powder at this point and cook for another 2-3 minutes. 3) Next add the basmati rice and keep tossing for another 5 minutes on medium flame until well toasted. 5) Transfer to a rice cooker, and add vegetable broth and water combination (or veg. bouillon paste + water) - the total must be 4 cups. Adjust salt as needed and cook till done. 6) When rice is cooked, stir in the drained and rinsed black beans, coriander leaves and lemon juice to taste. Cover and let the flavors come together for about 15-20 minutes before serving. 1) Combine sugar, ginger & water in a bowl, bring to a boil, stirring until all the sugar dissolves. Add the lemon zest and remove from the stove. Allow to cool. 2) Meanwhile juice the lemons and measure so you have 1.5 cups. 3) Strain the cooled ginger flavored sugar syrup and mix in the lemon juice. This can be refrigerated for several weeks. To make lemonade - add about 1/3 cup of the prepared lemonade concentrate, add ice cubes as necessary and top the glass with cold water. Variations: Add orange juice (pictured) with water and lemonade syrup for an orangey lemonade. Or mix with Pomegranate juice or brewed and cooled tea. I'm sure I've said this before but baby potatoes are the cutest :) Potato fry or roast is an eternal favorite but when made with baby potatoes it is extra special. Peeling them can be a bit laborious but it's worth it to bite into tender, spiced potatoes with a crisp crunchy coating... The kids love this too and using sambar powder instead of chilli powder lends flavor without it being too spicy for them. My MIL gave me this tip to add some bread crumbs and it lends a lovely crunch to this dish. 1) Pressure cook baby potatoes with some salt - I followed the same method I use for sepakizhangu, allow to cool a bit and peel. 2) Heat oil in a wide pan on medium preferably non-stick/ceramic, add turmeric, salt and sambar powder to the oil, stir for a few seconds (ensuring they don't burn) before adding the potatoes. 3)Toss on medium flame until well coated with spices and cover and keep for about 10 minutes or so.. stirring every once in a while. This will allow the salt and spices to penetrate the potatoes. 4) Remove cover and allow to toss until it crisps up on the outside. Add bread crumbs if using.. it lends a crunchy exterior to the potatoes. NOTE: The key is to not increase the flame or rush the process but continue roasting on a medium flame until done. I mentioned jicama (pronounced hicama) in my previous post as one of our snack items when in Mexico... sprinkled generously with tajin which is a Mexican spice powder and with a squeeze of lime a lot of things taste great! I've always seen jicama in the global food store near our place so bought some to make a salad. The friend who introduced me to jicama told me that people who want to lose weight eat it because it is high in water and fiber. Infact, 1 cup of jicama has about 50 calories, approx 12 grams of carbs, 7 grams of which is fiber. It doesn't have a very strong taste.. but it's more neutral, crunchy and juicy so blends well. Looking it up in wiki reveals that it's the veggie used in popiah and rojak in Singapore as well.. interesting! 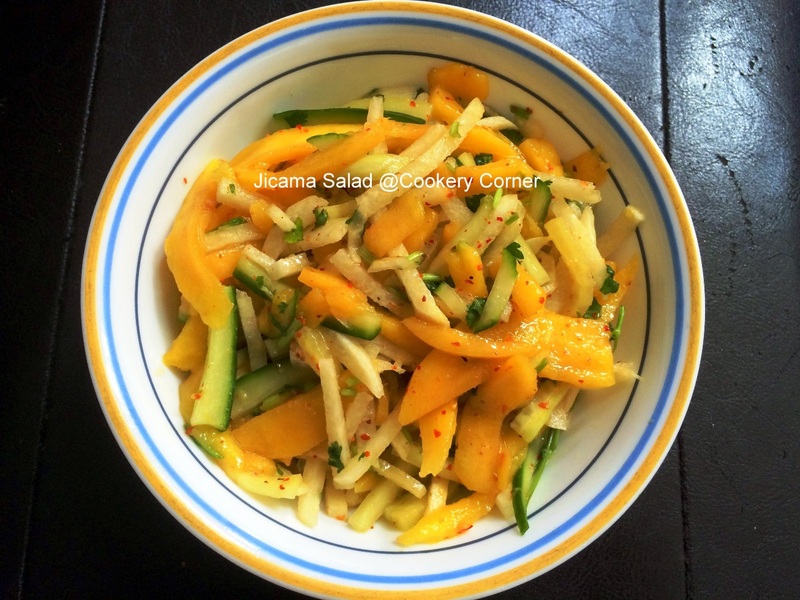 1) In a large enough bowl, toss together thin strips of jicama, cucumber and mango with the coriander leaves. 3) Mix this in with the veggies. Taste and add salt as needed. Allow to marinate (I put it in the refrigerator) for an hour or so before serving. I visited Mexico for the first time as part of a business trip and wanted to document the fun week & mainly the food I had at Guadalajara (pronounced Guada-la-hara) - which is the city I visited. I was treated to different kinds of Mexican food thanks to my colleagues who played such gracious hosts. What struck me most was how much it resembled India... I'm also thankful I got to experience the real Mexico and not an Americanized tourist version, which I understand from friends is what most holiday spots there are. Soon after I landed & checked in at the hotel, my friends picked me up and we visited Tlaquepaque which is a nearby city that has many restaurants, small street shops that sell a range of items such as souvenirs, wooden toys for kids, handmade bead bracelets,chains, painted pottery, glass art etc. We walked around to look at the handloom items & did some shopping as well before going to the Casa Fuerte restaurant... It was a great open atmosphere with a live cuban band playing and very relaxing and cool. My friends suggested I order the tamarind margarita and it didn't disappoint. I was quite nervous about what vegetarian options I would have but with a "no carne" check on every dish that the waiter suggested, I realized i had quite a few options... I chose the nopalese (cactus) salad served with an avocado by the side and a fried slightly sweet plantain stuffed with cheese - two appetizers that tasted great. This is my first time tasting cactus and I quite liked it. For dessert we shared a guava tart drizzled with caramel and served with some kiwi and strawberry sauces on the side. Breakfast was usually the buffet at the hotel and it we had quite an elaborate selection each day - even for a vegetarian like me... I usually had the egg white veggie omelette with a spicy salsa that absolutely reminded me of the freshly ground (on the ammi) red chilli chutney from my grandmother's kitchen. The highlight was the variety of fruits we had - perfectly ripe, red guavas, mangoes, papaya, watermelon, cantaloupe, oranges and grapefruit. I haven't had such tasty guavas in a long time. They even had a guava dish where it was sliced, scooped out a bit and replaced with a mild & sweet creamy cheese & coconut filling and topped with some caramelized coconut flakes and walnuts. I really enjoyed it. For lunch we visited different places each day.. I had a tasty panela (cheese) salad the first day at Roby's and the dressing was the highlight - it was a cilantro based one that was absolutely refreshing and light. I also tried chilaquiles divorcidad - which is basically a dish of fried tortilla strips topped with 2 kinds of salsas the green one and the red one and drizzled with some cream and with some crumbled queso fresco on top and washed it down with a hot cafe con leche. Some days we ate in the office cafeteria and I had a medley of veggies with rice that tasted exactly like lemon rice (sans the seasonings and with some corn). They use chayote (chow chow) in their stir fries and fajitas and i quite liked the crunchy sweetness it lends. I also tasted jamaica (hibiscus) juice and that is something i plan to make so have bought dried hibiscus leaves. For snack we usually got cucumbers or jicama (which is a crunchy tuber) or watermelon slices sprinkled generously with Tajin (a spicy and tangy chili powder) and squeeze of some small green lemons. 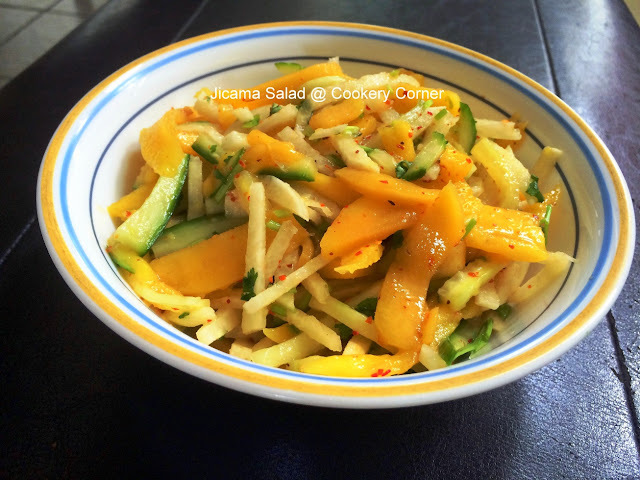 I have since then bought a jicama and made a salad, combining it with cucumbers and mango - very tasty. Will post the recipe sometime soon. Another interesting dish i tasted was a lemony dessert made with cream and marie biscuits called "Carlotta" - something I want to recreate at home as well. I also had some Chile Rellenos - chilies stuffes with cheese and served with rice and beans at the Los Otates restaurant. We went to the Las Tequillas restaurant for dinner one day, opted for the patio seating and enjoyed the cool weather.. it overlooked a ground where a soccer match was being played while we munched popcorn dipped in the spicy salsa with some mango margaritas... For dinner the suggestion was for me to try quesadillas (and these are not toasted but deep fried like puris) with different fillings like oaxaca cheese, zucchini blossoms, corn truffles (huitlacoche). Each one was unique and with some of the spicy salsa it tasted good. I also wanted to try the famous mole sauce so I ordered a dish of sweet plantains that were topped with a dark mole sauce with hints of chocolate in it... it was a delicious dinner and the ambience was great too. We also visited the downtown area of Guadalajara one evening , walked around soaking in the sights... the Cathedral there is beautiful and grand, there is also a statue of the father of Mexico - Miguel Hidalgo and the orphanage that is now converted into a museum... The courtyard also had some sculptures by Sergio Bustamente - very different... had chairs and sofas with legs and arms and some even had eyes... and some that were positively alien looking. We then we to La Cantina which is almost 100 yrs old and tucked away with a small unassuming entrance where we were entertained with live music and it was a great environment where everyone was friendly and singing together. We then went to a small restaurant which seems very popular called La Chata where I tasted some good Enchiladas with salsa verde and perfectly cooked and seasoned fried potatoes. After several days of Mexican food we went a Fusion place and didn't think I would be ordering burgers in Mexico but i was quite glad I did that in the Il Latina restaurant because they were fabulous... I liked the ambience of this restaurant - it was quite cool and I liked how for lamps they used inverted buckets that were painted and decorated and there was a framed wall filled with paper boats .. The burger had portobello mushroom, grilled zucchini and red peppers layered with some caramelized onion - delicious. For appetizers we shared a wonton dish, filled with sun dried tomatoes, mushrooms and cheese served in a creamy green sauce & some tomato bruschetta that my friends and I enjoyed. The desserts looked very tempting but I was too full to even share one. Finally on Friday, we drove to Lake Chapala after work and had a late lunch of veggie fajitas with some super guacamole and fresh made corn tortillas. Walked around the lake which was beautiful.. it was quite expansive & surrounded by mountains. It was nice to see houses with fences lined with bougainvillas and frangipani trees and it reminded me of India quite a bit. Thanks to my friends who made sure I had a great time and treated me like a "princesa". I had no idea that the kids would love mashed potatoes.... The few times I have tasted mashed potatoes myself (in the past), I wasn't really impressed - it tasted quite bland so I had no desire to make it at home myself. Here, I've served the mashed potatoes with a crunchy kidney bean salad and it made for a satisfying and easy dinner that the family enjoyed. Dried Rosemary - 1/4 tsp (optional), I add this because i like the combination. 1) Rinse, peel and dice potatoes into big cubes. Add to a pan and cover with water & add salt. Let this come to a boil and allow to cook until potatoes are very tender (test with a fork) - must be at a fall apart stage. 2) Meanwhile, in a small pan on medium low, combine sliced garlic, dried rosemary, cream and milk and allow to simmer for about 4-5 minutes. Cover and let rest until potatoes are done. 3) Once potatoes are at a fall apart stage, drain them completely and mash them with a potato masher till nice and smooth. If the potatoes are well cooked, this should be a breeze. Now add in the cream cheese and the garlicky milk-cream mixture and mash together. It will seem soupy and watery but fret not, it will thicken to the right consistency as it cools down a bit. For the Salad, toss together canned and rinsed kidney beans (cooked Rajma) with chopped peppers, cucumbers, carrots, de-seeded tomatoes, chopped kale or spinach. For the dressing, combine a tbsp of olive oil with some lemon juice, salt and pepper and toss with the veggies. 1) Grind Asafoetida, Green chillies, garlic with water to until well blended. Strain this and set aside the flavored, spicy water. 2) Sift rice flour, besan and pottukadalai with salt to ensure there are no lumps. Take this mixture in a bowl with chilli powder and add melted hot butter and mix well. 3) Next add the flavored water from step 1 above gradually while mixing to form a stiff and smooth dough. Add water as required if flavored water is not enough. 4) Use the dough press with the one for ribbon pakoda (it has 2 slits). Grease the press and add the dough. 5) Heat oil on medium (or slightly more) until a small bit of dough when added sizzles immediately and floats on top. Do not heat the oil too much. 7) Allow to cook on one side before flipping over and cooking till done (the bubbles surrounding the dough will subside quite a bit when ready). Drain to a paper towel and repeat this process until all the dough is used up. Store in an airtight container (once completely cooled) and enjoy! I love undhiyu and first followed Nupur's recipe - and blogged about it a while ago. It truly is a labor of love and the flavors of the different vegetables and the methi dumplings are phenomenal. 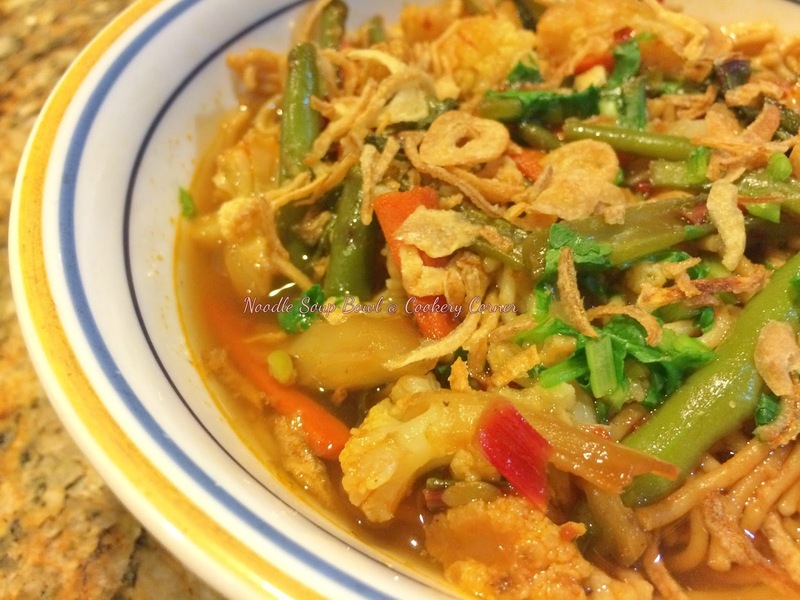 However, wanting a quick fix solution that will allow us to indulge in this curry on a weekday, I devised this shortcut method of using a combination of frozen foods and some fresh vegetables and this doesn't disappoint. This is in no way a traditional way of making this curry but it satisfies my undhiu cravings fabulously and enables us to have it more frequently.You can change the veggies around to your preference. I use the Bhagwati brand Methi Gota (frozen) - see picture below for the Undhiyu recipe and also to make Kadhi Pakodi effortlessly and it has a great flavor and all it needs is some heating up in the toaster oven. 2) Cut carrots into small rounds. microwave or parboil with a bit of water for about 5 minute. 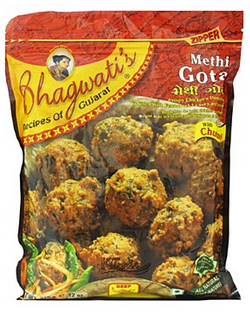 3) Cook the frozen methi gota in a toaster oven for about 10 minutes (or follow package directions). Cut each into half. 4) Heat oil in a wide pan, add the veggies and continue to saute for a few mins. Add about half cup water to this mixture with some salt, sugar and the ground green paste. Cover and allow to cook on medium-low flame. 5) Once the water has evaporated, stir in the methi gota and continue cooking for about 10-15 minutes more with occasional stirring. 6) Finally switch off the stove and stir in the lemon juice. Delicious with rotis. I have been seeing these colorful mini peppers quite frequently these days and couldn't resist buying them. Many times, I just use them as substitute for bell peppers but there was a recipe on the back of the bag for a stuffed pepper that sounded pretty tempting... I modified it from a purely cheese filling to include some chopped spinach. The white filling with specks of green contrasts really well with the colorful peppers (this time though since I blended everything it's a green filling, but tasty nevertheless). 2) In a small saucepan, heat olive oil and add in chopped garlic, onion and red chilli flakes. When they soften a bit add the spinach and some salt (go easy on the salt). Saute until spinach has wilted and cooked down a bit. NOTE: (this time since I forgot to leave the cream cheese out I put that along with the spinach mixture and blended.. hence the green colored filling - I personally prefer leaving little green specks in a white filling, which didn't happen this time). 4) Lay them on a cookie sheet sprayed with oil and top each pepper with a bit of bread crumbs and drizzle lightly with olive oil (a few drops on each peppers is more than enough). 5) Bake in a 350 degree F (pre-heated oven) for 15-20 minutes.... Allow to cool a bit and enjoy warm. .